We perform all business tasks under the intelligent guiding principles of Mr. Vishal Churiwal and Mr. Siddartha Churiwal, the honorable business directors of our organization. They both have played vital role in establishing the name of our firm in the list of renowned organizations that is just because of their sound business insight, years of experience in the concerned domain and outstanding managerial skills. Highly creative, experienced and hardworking team of professionals are working with us, who have played a vital role in keeping our status high in this tough competition. They work hard to serve to the customers’ demands efficiently, for which, they keep themselves updated with the growing preferences of the market. Our team encompasses designers, production personnel, quality controllers, sales and marketing personnel, logistics experts and many others. 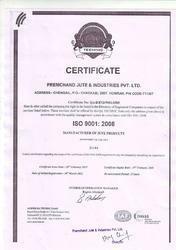 Manufacturing and Trading of HDPE Bag, Jute Soil Saver and many more. An innovative engineer, a proficient packaging manager, a quality analyzer, attentive warehouse official, dedicated workers makes our team. Our team respects the satisfaction of the client and therefore bring out a product which meets their expectations. Our team not only develop quality products, but also main superlative and healthy relation with the clients. Our team understands the requirement of our clients and thus supply them what they are looking for. Eco-friendly, recyclable is some of the features of our products which make us one of the valued organizations. Our infrastructure helps us in taking bulk order and make delivery on the given time frame at a very pocket friendly price. We have a healthy networking team, which helps us in exporting our manufactured items. By offering excellent items we have gained a valuable position in the industry. The clients acclaim us for the fabric which we use for manufacturing the range of products. Sourced from renowned and accredited vendors, we take a privilege of producing products which are environment-friendly, easy to maintain and available in wide varieties can be used for various purposes. With the help of innovative machinery and advanced technology, we are able to offer products which meet the industry parameters.